Korean Doraji beats others in taste and remedial effect. Doraji is a perennial herb that belongs to Canterbury bell. It grows in mountainous regions in Korea and is found in Japan and China. Its Korean name “Doraji” comes after “Dorat.” Other names include Dorae, Dolgaji, and Dore. In Chinese characters, it is known as Gilgyung, Baekyak, Gyeongcho, and Gogyung. 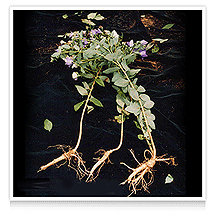 It grows to reach 40 cm or as high as 1 m. Its roots are thick and shaped like ginseng and a white juice flows out when the branch is cut or scratched. Its leaves alternate and often grow in whorled shape. Flowers are sympetalous in which ends stretch and split into five sections. Its flowers are adored by many for being pure and beautiful in white or jade colors. They usually bloom in August and September, but some kinds bloom earlier in May and June. Branches are straight and like sugar that causes water to drain well. Bellflower on ground mostly dry and die in winter since it is a perennial herb. In summer, nutrients made from photosynthesis are stored in the roots. Most bellflowers live for 3–4 years, but some sustain for longer years, which are known to have special remedial effect, even though they are few and far between. Korean Doraji are the best in the world. Winter and drought are the most turbulent moments for plants. Perennial plants growing in regions with temperature like Korea survive harsh winter seasons by keeping the roots and germs underground and sprouting them up in spring. Branches and leaves usually wither away due to the cold. These kinds of plants are known as geophytes in plant ecology in which Doraji also belongs to. In geophytes, nutrients are stored in the roots underground, and humans take advantage of them for consumption or remedial effect. Doraji that have been there for a long time are bound to contain more nutrients or remedial effects because they probably have saved more nutrients for longer period of time. Naturally, earlier generations thought old Doraji were powerful enough to cure all diseases, and such belief was supported by many cases. Korean Doraji is considered to be tasty and medically effectively in China, Japan, and other parts of the world. This is why it was exported to Japan, Hong Kong, and other countries for a very long time. Taiwan imports only Korean Doraji. The floral language of Doraji is “everlasting love”. It is a popular subject in myths and Korean folk tales. Keith, a British citizen, likened the flower of Doraji to a cone nuns or cloistresses wore on their heads, a sign of sorrowful beauty longing for the secular world. Once upon a time, there was a village in the foot of Mt. Daebal in Sangsung, Hanam Province in China where all villagers shared the same family name, “Sung.” One day, a mysterious disease started to spread across the village. Everyone in the village felt pressure on their chest, could not stop coughing and had bloated bellies. “Sangpoong,” who was an unmarried woman in the village, climbed up the high mountains and prayed for two days without a break and asked the God to save her family and villagers from the disease. Suddenly, a heavy wind blew and wrapped Sangpoong around to take her all the way to Mt. Ami in Szechuan Province. Stunned and dizzied by the wind, Sangpoong heard a voice calling her. Before her eyes stood a benevolent deity whose hair was white as snow and face young as a child. He showed his hands that had black and small seeds. She received the seeds and tried to make a bow to the deity when a wind suddenly wrapped her again and took her back to her village in Sangsung. As the deity instructed, Sangpoong planted the seeds, which soon sprouted up into purple flowers. Seven days later, she dug out the roots and gave them all to the villagers. All the villagers were healed, and the disease vanished. All villagers praised Sangpoong and named the herbal medicine Sangjeobgeun after the fact that it was shared by Sangpoong. Sangjeobgeun later was renamed to Gilgyung, which is the local language of Doraji.